For my A-Z CanLit Project‘s letter ‘N’, I went with Nancy Lee. 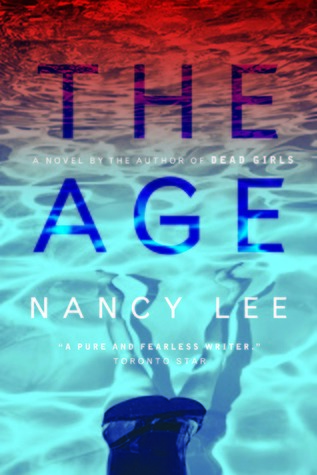 I thought about reading her story collection, Dead Girls, but decided to go with her novel, The Age. Has anyone read Dead Girls? In The Age, it is 1984, and there is a lot on the news about the threat of nuclear disaster. Gerry has been tuned into this fear, watching the news diligently and having nightmares about it. Instead of talking to her mother, she has been hanging around with a small group of anarchists who are planning something for the upcoming peace march. She is not afraid of the dark, she tells herself. She is afraid of spiders, of dying a virgin, of the new virus, detonators and plutonium, warships in the Persian Gulf. She is afraid of airplane sounds, the shape of certain cloud formations, gas masks, submarines, the electric squeal of the emergency broadcast system, farmers’ fields that open to mile-deep silos. She is afraid of generals and admirals, and old white presidents. Of seeing her father, and never seeing him, of radiation sickness, and reincarnation, being vaporized only to return to an annihilated world. I have to admit that I didn’t really enjoy this book, but I do think it is good. It is dark and sad, but with a certain kind of energy. Even though I tried not to, I cared about what was happening. Gerry’s (probably very normal) hurtful behaviour toward her mother frustrated me, the group of adults she hung out with made me mad, and her friend was a jerk. But I cared about Gerry and her safety, and I cared about her working things out with her mother. The writing. I would definitely read more by this author. The pop-culture references to the 80s – the music, the movies, the clothes, and the bad hair. The end. Good ending with a much needed feeling of hope. The author’s vivid description of the peace march. Gerry’s Grandfather taking action (even though it was a terrible example for his granddaughter). The story Gerry imagined about a post-nuclear world in which ‘monstrous’ babies are being born, and raiding and pillaging are a common occurrence. Reading about Gerry’s relationship with her mother. The overall feeling of loneliness that radiated off most of the characters. Most of the characters made me mad, except for maybe the mother. Gerry’s group of ‘friends’ sat around talking about the same things every night. Didn’t they have other things to do? The story in this book just wasn’t my thing, but others might love it. If you’ve read it, let me know what you think! Do you ever get frustrated with fictional characters when they have what they need but can’t see it, or choose to ignore it? The Blurb on the book describes Gerry as “stubborn, tough, and unaware of her vulnerability until tragedy occurs...”. And the book is “at once a heartbreaking journey through adolescent recklessness and desire and a portrait of a generation shaped by nuclear anxiety“. Perfectly described. Visit Nancy Lee’s website for more information about herself and her books. Her interviews, in particular, are interesting. I’m just curious why Nancy Lee is under N instead of L. I thought you were going by first names, but then you mentioned some O names. On O, everyone in my book club enjoyed Ondaatje’s book The Cat’s Table. That’s the only thing I’ve read by him except The English Patient. I have mostly been going by last names, but in this case I went with the first name. I wasn’t in the mood for the other possibilities, and using the first names as well opened up more options for me. Good to know all of you enjoyed The Cat’s Table – I do own that one! I think it is better when characters do things rather than talk. I find I admire an author’s skill more when they can show things happening in a more dynamic way. I think the ‘friends’ who don’t seem to do much was more the characters’ flaw and not the author’s. I think they are supposed to make me mad (or something like mad – I can’t quite put my finger on it). The Bloor Street Viaduct in Toronto. I’d like to see it sometime. The other Bookmark I’d really like to see is in Winnipeg, for Carol Shields’s The Republic of Love. And, of course, the new one for No Great Mischief in Port Hastings, NS, after it’s unveiled next week. The Republic of Love is another one I want to read. It is sitting on my shelf. I also own Skin of a Lion, and am starting to lean heavily that way. I’ll have to make a special trip to Part Hastings soon! My son has a football game in Sydney next month. Hmm. I tried to read Lullabies for Little Criminals and didn’t end up finishing it so my vote is for Ondaatje. I’m with Denise that it’s better when characters do rather than say. Show me what’s happening, don’t tell me. Sorry that this one ended up frustrating you! Oh well. You can’t like them al! She’s a good writer, though. It looks like Ondaatje is going to win out! Too bad this one didn’t work for you. I get frustrated with characters a lot, particularly when I’m reading a classic. But at least the author managed to evoke an emotion in me, even if it’s a negative one. I have yet to read O’Neill’s book, since it was shortlisted for the Women’s Prize. So I’d be curious to hear what you think of it. Yours is the first vote for Lullabies. I’ve heard some people praise that book, and others not like it at all. It does make me want to find out for myself. I missed my streetcar stop for Lullabies. And I didn’t think I was even going to like it, but then had to walk backwards several blocks to prove how wrong that was. She has an incredibly compelling voice (and there is a surprisingly bookish side to the story). That gets me excited for it all over again. I own that one, too, so I will get to it eventually (I hope!). I’m also interested in reading her new short story collection – I’ve heard lots of people praising it. When you ask: Do you ever get frustrated with fictional characters when they have what they need but can’t see it, or choose to ignore it? It reminds me that is the way in real life. A lot of us can’t see that we have what we need or we choose to ignore that. Unfortunately. Naw. Don’t do that. Just read them with your fingers cross. From the snippet you share, I think I’d love the writing too! I think I’d probably be very bothered by the characters too though. Frustrating characters are the worst. Great writing – it’s what kept me reading! I would still like to try her other book. Do I ever get frustrated with characters? YES, especially if the book doesn’t seem to think that what I might think was stupid WAS stupid. The very first book that popped into my head was The Paris Wife. I had to DNF because the girl wore me out with her stupid decisions. I didn’t care what happened to her. Ha! I think it would bother me even more if they are adults making stupid decisions. When I was reading Far From the Madding Crowd, Bathsheba was getting on my nerves a bit. I had to keep reminding myself how young she was. I am so glad you didn’t really like this book. I started it multiple times – the premise appeals to me – but I always end up putting it down and picking something else up. Maybe it’s not me, maybe it’s the book. And I love Ondaatje. Skin of the Lion is classic. The Cat’s Table I’ve not finished. He’s a great writer, but sometimes a little on the dense side. Skin of the Lion is far more accessible than some of his others. I am so glad to hear you also had trouble getting into the book. And, that there’s someone else out there who has read it/tried to read it! I’m thinking it will be Skin of a Lion. I’ve even picked it up a few times and flipped through it. I recently read an Octavia Butler book – my first – because she was recommended by Ursula K. Le Guin. Parable of the Sower – have you read it? It was not a *great* book, but it was unique and has stuck in my mind. Good characterization. I’m not usually a sci-fi fan, but it’s not hard-core. Too believable, actually. Just another O suggestion. I haven’t read anything by Octavia Butler, but have had Kindred on my list for a while. Now, I’m wondering if you have read the Maddaddam trilogy by Margaret Atwood? I’m not a big sci-fi fan either, but I loved those ones. Swarm by Lauren Carter is another good one that takes place in the not-too-distant future. No, I haven’t read them. I heard Atwood do a reading – more like a play where she was the narrator, actually – of The Year of the Flood. It was fascinating. I’ll get around to them sometime. The only other sci-fi I’ve enjoyed was Dune, of course, and Sparrow, which was amazing. I’ll try Swarm, too. Thanks! Yes – “pending doom and anxiety” sound about right. Have you read Dead Girls? I just read a single story after I finished the novel. Somehow, it just hasn’t been the right time for me, whenever I’ve picked it up over the years. But I do intend to return. You thinking about it too? I just haven’t heard yet from anyone who has read it, and I’m curious if it has the same tone, or if it’s completely different.